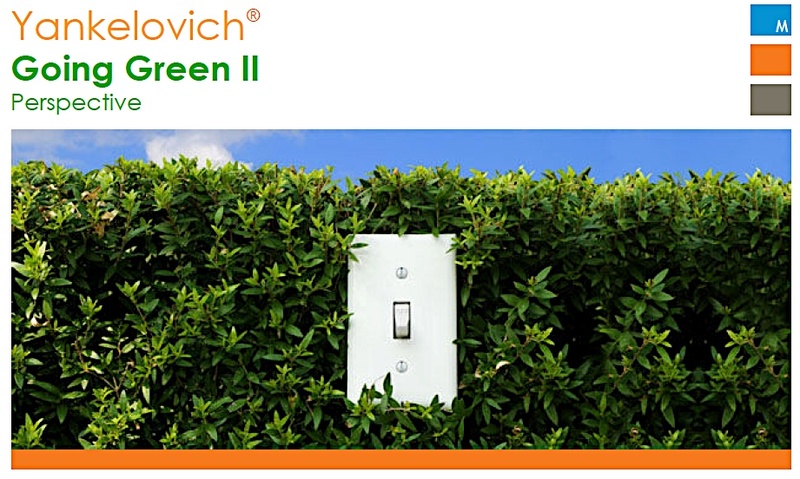 The new Yankelovich report on green living is out, and is confirming what we have been seeing in the marketplace. Sure, citizens are concerned about the environment, but they are not willing to pay extra for green products. The pressure is on marketers and policy makers to green their stuff, at no extra cost to consumers. Of course, this does not relieve citizens from their responsibility to consume less. The HCHLV Green Consumer Segmentation was just recognized by its parent company, WPP marketing communication giant, as one of the best pieces of work in the area of ‘Market Research and Insights’. Although developed for the British market, this segmentation provides yet another valuable way to look at consumers/citizens. At the disengaged end of the spectrum, over a quarter of UK adults are ‘Onlookers’ – those who are the least engaged and have a limited level of concern about ethical and environmental issues. 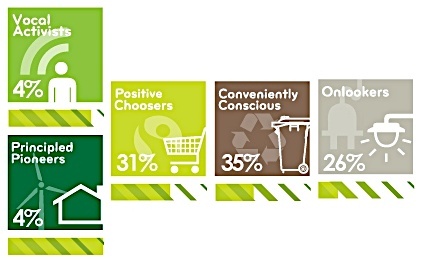 Moving along the spectrum, the ‘Conveniently Conscious’ make up over a third of UK adults. This group is aware of and fairly concerned about ethical and environmental issues. They will take easier steps such as reducing their water use, but are not interested in more involved ethical consumption or local issues. The ‘Positive Choosers’ are highly aware of ethical and environmental issues and feel guilty about their lifestyle. They regularly buy from ethically sound companies and will boycott those they feel are not acting responsibly. However, they will rarely complain actively, choosing instead to walk away from companies they disapprove of. There is a small segment of the population, the ‘Vocal Activists’, who hold similar attitudes to the ‘Positive Choosers’, with the exception that they are much more likely to articulate their discontent. The most engaged segment is the ‘Principled Pioneers’. These consumers are more prepared to make significant investments of time, energy and money, alongside lifestyle changes, to turn their beliefs into actions. This includes highly engaged activities such as installing alternative energy sources and calculating their carbon footprints. This way of segmenting consumers/citizens is remarkably consistent with the most recent Pew Survey of Americans. Basically, slightly less than half of the population is positively inclined regarding environmental issues that really matter. A glass nearly half full, that’s a start. Communication efforts should focus on nudging some of the ‘Conveniently Conscious‘ more towards the left. There is no disputing the importance of the social factor, in moving citizens along the greener path. One additional element to take into account, is the issue of personal relevance. How does one turn global warming solutions into personal benefits? Research shows that most direct way to interest people is through their pocketbook. Last, I would add the availability of technology to enable desired behavior changes. Best examples of green ventures that understand the power of the PST formula, are in the area of home energy efficiency. Agilewaves, Greenbox, and Lucid Design Group show great promise. The study examined the extent to which groups of widely connected people quit smoking together. Friends with more education influenced one another more than those with less education. These effects were not seen among neighbors in the immediate geographic area. Network phenomena appear to be relevant to smoking cessation. Groups of interconnected people stop smoking in concert, and smokers are increasingly marginalized socially. These results are similar to results of a prior study from same authors on obesity. The network effect is at work not just in the halting of negative behaviors, such as smoking or unhealthy weight gain, but also in the spreading of positive life changes such as happiness. The latter will be documented in a forthcoming study by the authors on,’The Dynamic Spread of Happiness in a Large Social Network’. The implications for climate strategies are obvious. Behavioral change conservation efforts, will work best if focused on groups, not just individuals. This is a confirmation of the research done by the ‘Nudge‘ team at University of Chicago. The smoking study also shows which clusters to focus on. Friends, as in Facebook or Twitter, coworkers as in Carbon Rally, spouses as in family systems. Thanks, Meryn, for all the links.